Weather: Summers 5° to 40°C. Winters -14 ° to 24°C. Jammu & Kashmir (J&K) is the northern most state in India. It is surrounded on the north by Afghanistan and China, on the east by China, on the south by the state of Himachal Pradesh and the state of Punjab in India, and on the west by the North-West Frontier Province and the Punjab Province of Pakistan. 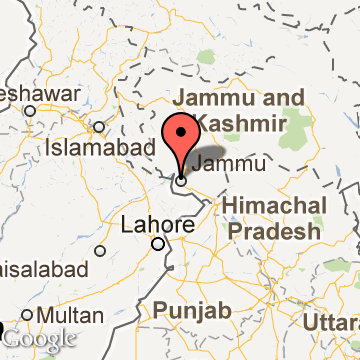 J&K covers an area of 222,236 sq km (85,805 sq mi). Jammu and Kashmir are really three regions: the foothill plains of Jammu; the lakes and blue valleys of Kashmir rising to alpine passes, the high altitude plains and starkly beautiful mountains of Ladakh which lies beyond those passes. The Indus River flows through Kashmir and the Jhelum River rises in the northeastern portion of the territory. Kashmir possesses a more equable climate than that of southern and central India. The beautiful Vale of Kashmir is a noted resort region. Srinagar is Jammu and Kashmir's summer capital and Jammu is the winter capital. The state of Jammu and Kashmir which had earlier been under Hindu rulers and Muslim Sultans became part of the Mughal Empire under Akbar. After a period of Afghan rule from 1756, it was annexed to the Sikh kingdom of Punjab in 1819. In 1846 Ranjit Singh handed over the territory of Jammu to Maharaja Gulab Singh. After the decisive battle of Sabroon in 1846, Kashmir also was handed over to Maharaja Gulab Singh under the Treaty of Amritsar. British supremacy was recognized until the Indian Independence Act 1947. The state of Jammu and Kashmir is not merely the Vale of Kashmir. It is a very large state and only slightly smaller than the British islands. The state of Jammu and Kashmir comprises of three distinct regions and is the largest Himalayan state in India. These regions are Jammu, mainly the Hindu region lies in the foothills in the south; Srinagar and the Vale of Kashmir is mainly the Muslim region and lies in the centre; Leh and Ladakh, form the eastern highlands across the great Himalayan axis and comprises of mainly the Buddhists. While, Srinagar, a city of beautiful lakes, Mughal gardens and wonderful shopping opportunities is the summer capital of Jammu and Kashmir. Jammu is the winter capital of Jammu and Kashmir. The state of Jammu and Kashmir has three distinct entities with different climate, flora, fauna and cultures. The people in these parts do not only live differently but also speak different languages, worship different gods and have different ethical and moral codes.